In the July OGS ‘Notebook’ you mentioned using clear plastic sheeting to dry firewood. 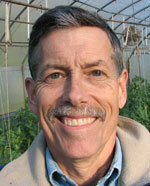 Is there a ‘greenhouse grade’ clear plastic that is different from conventional clear plastic? I would expect that covering a pile of wood with clear plastic sheeting will cause “sweating” inside the plastic and actually cause the wood to rot. Can you send me a reply with a more detailed description of your wood-drying method? I appreciate all your helpful info! We installed a wood furnace last fall to help heat a greenhouse on our farm. We have not been through a full heating season with it yet but on paper we will need seven to ten cords a year. Dry wood is easier to ignite and it burns more efficiently with more heat to the heated space and with less wood smoke to cause health and aesthetic problems. My interest in dry wood led me to explore solar assisted wood drying. The lumber industry dries wood for a variety of reasons. 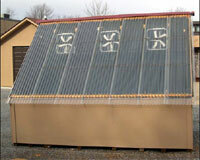 Appalachian State researchers developed an interesting solar kiln. Virginia Tech has an interesting design too. I suspect these devices would be great at drying firewood but they are a little more expensive than needed on our farm. 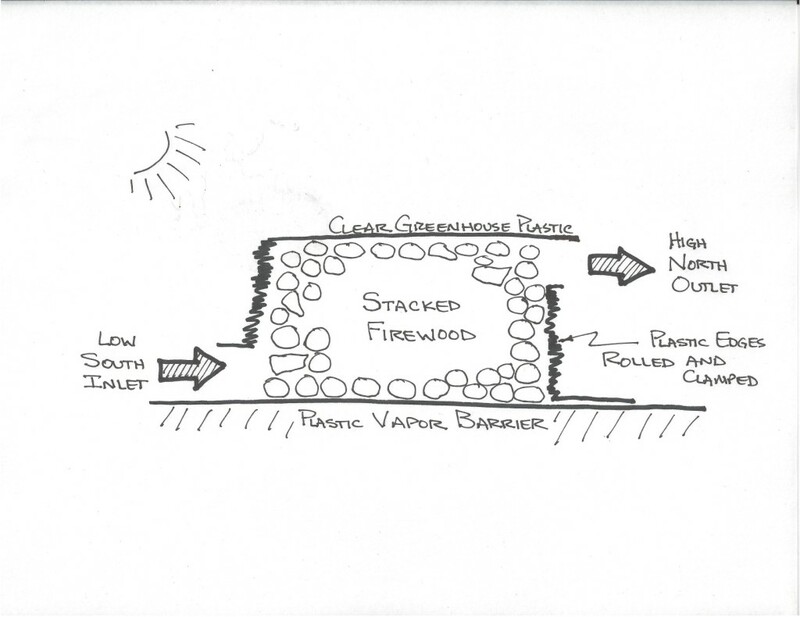 My comment last month suggested using a very basic “solar chimney” concept employed in these designs to dry firewood but with a less elaborate structure. You raise a good point about condensation inside the plastic. It is important to allow heated air carrying the moisture from the wood to escape at the top. Industrial scale dryers are designed to avoid “short circuiting” so they have baffles to force the air to move through the material to be dried and to avoid the moving air going directly from the inlet to the outlet. The simplest version of this concept may be to cover your firewood stack with clear plastic and clip it shut on both ends except for an air inlet low on the south end and a solar chimney outlet high on the north end. If the firewood stack is not exactly in a north-south alignment, it probably does not matter as long as the plastic fits snugly around the stack of firewood the low inlet and high outlet are provided. The firewood itself will provide the baffles and support for the plastic. Another sheet of plastic under the pile will help prevent moisture from the soil entering the lower layers of wood. This sketch to the right might help. I found a description for a more careful stacking technique here. Start with a good supply of free pallets. Arrange a row in a north-south direction so it gets even sun to both sides. Stack two ricks side by side, leaving an air space between them. Reduce the air space between them as the ricks get higher until they touch at the top. Make an effort to have the top sloped away from the center. This should form a corbelled arch and be fairly stable. Finally, attach clear plastic starting just above the pallets and ending near the middle of the top. The top center should remain open to allow air flow but not so wide as to allow excess rain into the stack. Keep the base of the pallets clear of weeds and grass to allow for good air flow. Also, you should put down a vapor barrier below the pallets to keep ground moisture out of the pile. Clear builder plastic which is available in building supply centers is typically not treated to resist ultraviolet radiation from the sun and will come apart usually in a few weeks or months. Greenhouse plastic is UV stabilized to last for many years. It is usually guaranteed for four years but I have had plastic on the north side of one greenhouse for twenty years. UV treated plastic is available from greenhouse supply houses. My most recent roll came from Griffin Greenhouse Supply in Knoxville which will deliver to our area for a small charge. For a smaller amount of plastic I suggest checking with commercial greenhouses in the area. They regularly replace their plastic and are likely to be happy to have you haul away part of it.